Pump Up Your Book is pleased to announce Stephanie Keyes’ The Star Child Virtual Book Tour 2012 beginning February 6 and ending on February 29 2012. Stephanie will be on hand during this worldwide online book tour to answer any of your questions! For the past twelve years, Stephanie Keyes has worked full time as a Corporate Educator and Curriculum Designer. She holds a M.Ed. from Duquesne University and and a B.S. in Management information Systems from Robert Morris University. Stephanie is a clarinetist, saxophonist, and vocalist, and is always making music somewhere at sometime. 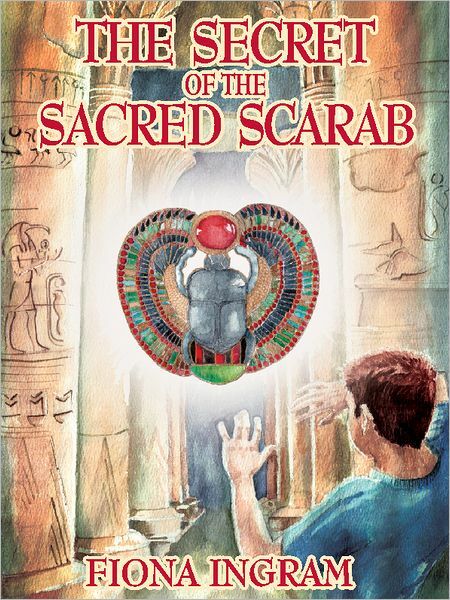 She credits her loving husband of ten years and her two sons for the completion and publication of The Star Child. 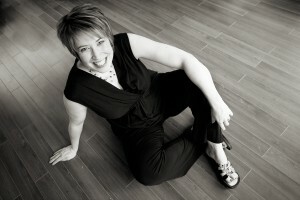 Stephanie is a featured author on www.LoveaHappyEnding.com. You can visit her website at http://www.stephaniekeyes.com. Kellen St. James is just your average seventeen-year-old prodigy, but with a Yale degree, a photographic memory, and an addiction to everything 80s. But what’s not so average about Kellen is the girl who’s been haunting his dreams for the last eleven years. When the sudden death of his grandmother takes him from the East Coast to the Irish Coast, he finds himself face to face with his own personal ghost and finds out that she’s just as real as he is. Plus she’s come spinning a tale about an ancient prophecy in which Kellen plays a key role. Together they will travel through an underworld of faeries and demons, angels and gods, not to mention a really ticked off pack of wild dogs, all in order to save the world from darkness. But will they make it in time? If you’d like to interview Stephanie or review his book, contact Dorothy Thompson at thewriterslife(at)gmail.com. Pump Up Your Book is an innovative public relations agency specializing in online book promotion for authors. Visit us at www.pumpupyourbook.com. 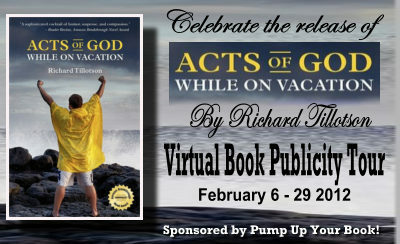 Pump Up Your Book is pleased to announce Richard Tillotson’s Acts of God While on Vacation Virtual Book Tour 2012 beginning February 6 and ending on February 29 2012. Richard will be on hand during his worldwide tour talking about his book in candid interviews and guest posts! Lots of fun along the way as Richard stops off at blogs around the world to give his fans a chance to ask him questions and to find out more about this talented author. 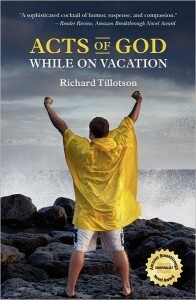 Richard Tillotson has been a Peace Corps volunteer in Borneo, a playwright in New York, a copywriter in Hawaii, and is a relative of an English Lord, all of which helped him write Acts of God While on Vacation, a National Semi-Finalist for the 2009 Amazon Breakthrough Novel Award and named “Hawaii’s best fiction book of 2011” by The Honolulu Star-Advertiser. He works in Honolulu and vacations in Washington DC. ACTS OF GOD WHILE ON VACATION begins with a death threat received by a philandering general manager of a lavish Hawaii resort, jumps to an anthropologist researching headhunters in the jungles of Borneo, then to a demonic, scandal-mongering paparazzo in New York, and on to a gorgeous, party-loving English aristocrat in London. Alternately desperate and hilarious adventures draw them all to Waikiki, where their arrival coincides with an international conference on shamanism and a catastrophic, force-five hurricane. ACTS OF GOD WHILE ON VACATION was a National Semi-Finalist for the AMAZON BREAKTHROUGH NOVEL AWARD. 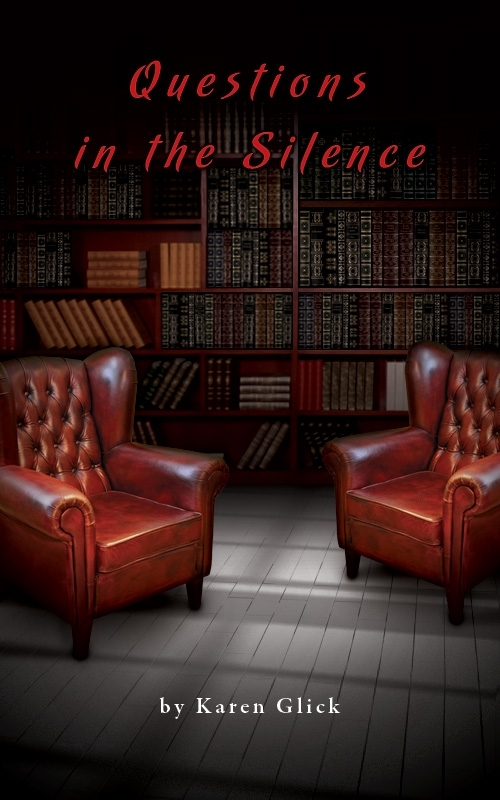 If you’d like to interview Richard or review his book, contact Dorothy Thompson at thewriterslife(at)gmail.com. Pump Up Your Book is an innovative public relations agency specializing in online book promotion for authors. Visit us at www.pumpupyourbook.com. Gordon Gumpertz, author of the action adventure fiction novel, Red Hot Sky, is stopping off at Review From Here on Day 11 of his virtual book tour with Pump Up Your Book! 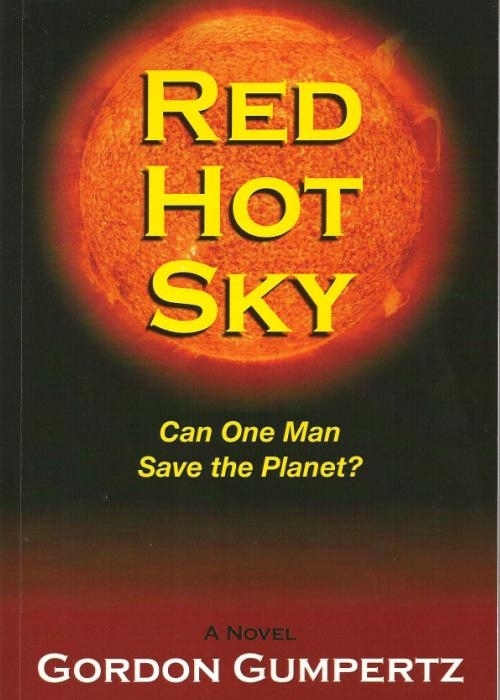 Read his interview at Review From Here at http://reviewfromhere.com/2012/01/17/interview-with-gordon-gumpertz-author-of-red-hot-sky/! 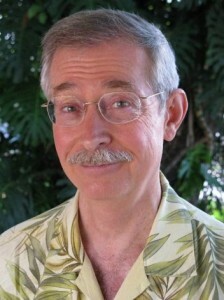 Visit Gordon’s website at www.tsunaminaturaldisaster.com. Gordon Gumpertz, author of the action adventure fiction novel, Red Hot Sky, is stopping off at Virginia Beach Publishing Examiner on Day 10 of his virtual book tour with Pump Up Your Book! Read his interview at Virginia Beach Publishing Examiner at http://www.examiner.com/publishing-in-virginia-beach/interview-with-gordon-gumpertz-author-of-red-hot-sky!